The Redpark Ethernet+Power Adapter is a specialty version of its USB to Ethernet adapter. The powered Ethernet adapter provides a general purpose Ethernet connection while also connecting the iPad to power. The Ethernet+Power Adapter is a specialty version of USB to Ethernet adapter. It provides a general purpose ethernet connection and also connects the iPad to power. The Redpark Ethernet+Power Adapter enables connections to point of sale systems, kiosks, automation control systems and other uses when an iPad needs to be connected to a network interface and to power. Redpark Product Development, which shipped the industry’s first Ethernet Cable for iPad and iPhone, announces the first Made for iPad (MFI) compliant powered Lightning ethernet adapter. The Ethernet+Power Adapter is a specialty version of USB to Ethernet adapter. It provides a general purpose ethernet connection and also connects the iPad to power. The Adapter is compatible with any iOS app that makes use of a Redpark ethernet SDK. “We’ve designed the Ethernet+Power Adapter for use in point of sale systems, kiosks, automation control systems and other use cases where there is a need to connect an iPad to a wired network interface and to power. While WiFi is suitable for many commercial applications, wired ethernet provides unmatched reliability and security,” noted Redpark president Mike Ridenhour. 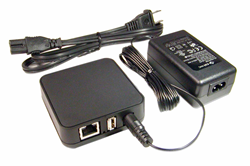 An Ethernet+Power Adapter FAQ provides more details about Ethernet+Power Adapter functionality. The Ethernet+Power Adapter has an MSRP of $129 and is available today.